Our collection of photographs and graphics of labyrinths and mazes from around the world is unrivalled. Browse our extensive photo library for a selection of the images we have on file, and if we don’t have what you are looking for, we can probably tell you who does! 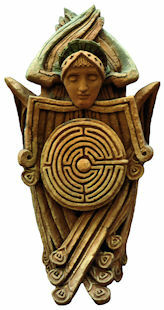 Founded by Jeff Saward in 1980, Caerdroia - the Journal of Mazes & Labyrinths is the world’s only specialist journal researching and documenting the history, development and distribution of mazes and labyrinths, from the earliest rock carvings and artefacts to modern puzzle mazes of ever increasing complexity. The Caerdroia Archive on this website contains articles from back issues of the journal and much more information on labyrinths and mazes in general. We have many years of experience writing, editing and producing labyrinth and maze-related books, magazines and articles. If you are writing about labyrinths and mazes, publishing an article or book on the subject, and need illustrations, information or your facts and figures checking, contact us. Jeff has been designing and building labyrinths and mazes for over 35 years; a number of his recent installations and co-operative works are shown on the labyrinth construction page. If you are looking for help with design, construction or restoration, we can provide advice on all aspects of the process, and if you just want some simple instructions for creating a classical labyrinth, here’s a page with guidance on labyrinth layout. Jeff and Kimberly are both accomplished speakers, having lectured internationally for many years to both enthusiast and academic audiences. Drawing on their vast experience of the subject, their presentations and workshops, illustrated with photographs and images from the Labyrinthos Archive & Photo Library, can be customised to any specific focus or group. Contact us for details. We have worked with many university and graduate students over the years, and our extensive archives and specialist knowledge can be a valuable resource for your own research and academic study. We have now retired from running tours, but if you are planning to visit mazes and labyrinths and need information or help you are welcome to contact us. You are very welcome to contact us here at Labyrinthos HQ. If you are seeking publications, information or advice concerning labyrinths and mazes, our archives, materials and resources are unrivalled. With over 60 years of experience of working with labyrinths and mazes between us, we like to think our knowledge of the field is without equal. Labyrinthos was founded in 2000 by Jeff Saward & Kimberly Lowelle Saward to provide an information resource for those working with labyrinths and mazes. Between us we have been working on this subject for over 60 years and have an extensive photographic & illustration library and archive. We offer professional maze and labyrinth design and construction, consultation and services for owners and designers, researchers and students, publishers and producers, etc. and Labyrinthos also publishes Caerdroia - the Journal of Mazes & Labyrinths.